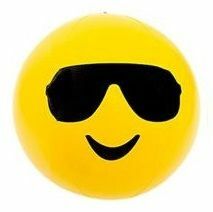 A cool summer inflatable that has the fun sunglasses emoji design just like the emoticons on your mobile phone. This blow up beach ball is a great novelty gift for both kids and adults, as a pool, garden, or beach toy. The beach ball is easy to inflate and measures 9 inches in diameter. Emoji inflatables are also great for crowds at music events, night clubs, and festivals, or as fun indoor or outdoor pool toys.